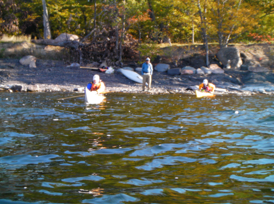 October 10-12, Columbus Day Weekend: For several years, Bruce, Alan and I have done a three-day paddle over Columbus Day weekend in October. Our usual target is Lake George. The Lake is beautiful and as of that weekend, you do not need advanced reservations to take an island site. 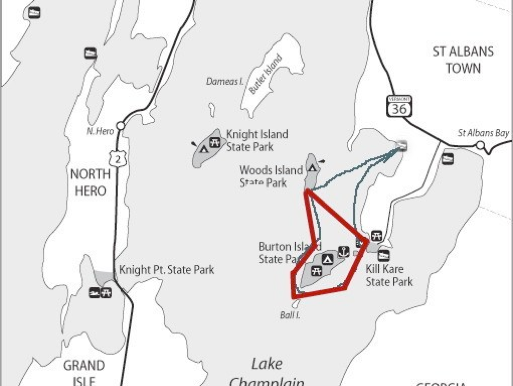 This year however, Bruce suggested traveling to Lake Champlain’s Inland Sea to do a base camp paddle out of Vermont’s Woods Island State Park. I must admit, I was a bit put-off by the idea. Champlain is big water. One of the worst days I ever had on the water I had on that lake, and only once out of half-a-dozen times was it calm. Every other time I was in a blow or paddling against an unrelenting headwind. But, Bruce persisted, so I looked into it. I found that Woods Island is two to two and a half miles from the closest put in at Kill Kare State Park. There is about two miles of open water paddling to get to the island that, depending on wind strength and direction, could be challenging. Still, it was only two miles. 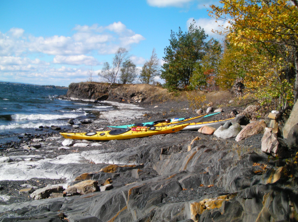 Bruce had stopped by the island during a summer paddle and had identified a campsite on the southern end that he thought offered a gorgeous view of the lake and the Adirondack Mountains in New York to the west. Since Alan and Bruce are still working men and I am not, it fell to me to gather the details and plan the logistics of the trip. I found the Vermont State Parks website to be excellent, with all the information I needed to begin my planning. A contradiction regarding the need to register for a site after the season led me to call the Kill Kare park office. I left a message and to my surprise received a call from the park manager a few hours later. He answered all my questions. I was impressed with the personal attention the Vermont Park Service gave to an out of state guy. There was indeed a new permit system in place, so I secured the proper forms on-line and submitted them immediately. From Bruce’s description we wanted site #4 at the South end of the island. October 10: With our plans made we were ready to go. Somehow Alan left Philadelphia by 3:00 am and made it to Bruce’s house in Schodack by seven or so. They both were at my house in Troy before 8:30 am for the four-hour drive to Kill Kare State Park in Vermont. We arrived around 1:30 pm and immediately began loading gear for the paddle to Woods Island that we could easily see in the distance. The sky was overcast and the temperature was hovering around forty-five degrees. 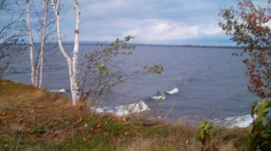 There was a strong southwest wind blowing on shore at fifteen to twenty miles per hour. It was cold. We loaded up and climbed into dry suits and wetsuits layered with long johns and other gear to stay warm. Despite the temperature and the wind we were bedeviled by swarms of bugs we identified as termites. They got into everything and were making us nuts. The paddling was hard but not difficult. We were really pushing to get to the island so that we would have enough time to set up and cook dinner before dark. It felt like a forty-five minute sprint. I was winded by the time we arrived. The landing was miserable, as it was rocky and there was no place to entirely escape the wind or breaking waves. We managed to land the boats without serious damage and set about scouting the camp. The area designated for tents sat up on a cliff above the lake. It had a magnificent view, but was wide open to the wind. Bruce and Alan set up their tents near the cliff edge, hard in the middle of the wind. I found a hollow that let me place my tent mostly below the wind. I was concerned that rain might flood out the area, but a close look convinced me that any run off would be slight and could pass under my tent without harm (I was using two ground cloths- a footprint outside and a larger ground cloth inside). Soon we heard a friendly voice call out hello. It was Phelps Holloway, one of our Vermont friends who had paddled out to join us. Phelps wisely set up farther back in the woods. 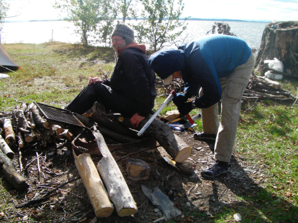 We gathered firewood and built a fire. Alan put a pan of prepared lasagna on the coals to warm. We had a great meal of lasagna, bread and brownies. It was dark by six-thirty. We sat around the fire for a while. There were more stars than I had seen in years. I was even able to see the Milky Way. Off to the north there was a bright glow on the horizon. 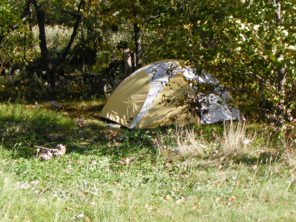 Phelps said it was Montreal, only about seventy miles away from where we camped. We were puzzled by a long string of lights blinking in unison on a mountain on the far New York side of the lake. Phelps said it was a wind farm. The lights were to warn off aircraft. The weather radio said that there could be snow by the morning and we were all starting to get cold, so about nine-thirty we headed for our tents. I tried to call Lisa, but no cells registered, so I gave up. I layered up, pulled the extra blanked over my sleeping bag, pulled on my watch cap and turned out the light. It would be a cold night. Sunday, October 11: We didn’t paddle at all today. The wind continued to build through out the night. It woke me up several times, not just from its howling, but also from the thrashing of the cooking fly. I hoped it would make it through the night. About four o’clock there was a brief shower that sounded like hail slamming the tent. I stayed in bed until seven-thirty. A look at the lake showed sea conditions that were terrible. It was just not worth the very real risk of a capsize in this cold weather, especially since no one but Phelps had a roll he could rely on. Thankfully the temperature was in the low forties, not the low thirties as predicted. The warming effect of the lake must have protected us from the predicted freeze. It was still overcast and blowing harder than ever. Bruce had been out for his morning walk and said that wind conditions were better at campsite three, so we grabbed breakfast and our cooking gear and headed over there. When we got to site three we found conditions nearly as bad as at our home site. Eventually we strung a tarp between two trees as a windbreak to cook behind. 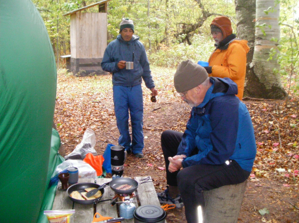 Even so, it took a long time for Alan to get our breakfast of bacon and French Toast cooked. Somewhere around mid-morning the overcast lifted and the sun appeared, offering a little more warmth when out of the wind. We spent our day hiking the island, cutting wood, sleeping, reading and just trying to stay warm. The island is very pleasant. 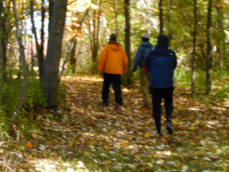 We explored the few trails that exist and were able to check out all the campsites. It seems that there is one site on the southwest corner of the island (#4) and one on the northeast (#5). The other sites are all strung along the western side of the island (sites #1, #2, #3). Only site five would offer any relief from this wind. I cooked dinner; chicken fried rice. I made enough for six people, but we ate it all. After dinner and cleanup, we all carted things to the boats, a hedge against rain (or snow) in the morning. Alan wanted a fire, but with the wind still rising, we all said no. We were concerned that we might ignite a fire that we couldn’t control. My new miniature butane lantern allowed us to stay up and complete some tasks till about eight o’clock when we all headed for our tents. The sky was crystal clear. Temperatures in the low thirties or high twenties were predicted for tonight. Alan and I decided to skip breakfast, pack up quickly and paddle back to Kill Kare. Had the weather been better we might have stayed to paddle, but Alan was driving. He had a four-hour drive to get us back home, and he was planning to continue on to Philadelphia. Phelps elected to stay a while longer and make his way back on his own later on. The paddle back was great. It was what we would have wished for the rest of the weekend. To stretch the paddle out a little, we paddled around the outside of Burton Island and back into the cove that held the ramp at Kill Kare. At the ramp we were bothered again by those bugs we had called termites, but Phelps had called something else. I don’t remember the name. It was a local nickname for the pests. (Maybe one of the other paddlers on this trip will chime in and remind me.) The bugs were swarming. They got into all of our gear as well as into our eyes, nose and mouth. Note: Karl talked about seeing a splintered outhouse, found after a terrible storm this summer. It happened to be the one I saw at site #3 and commented on. 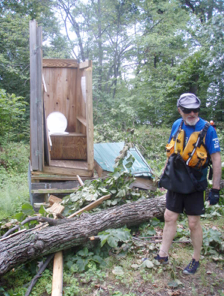 I am including a picture of Rob Gordon standing by the outhouse shortly after that fateful storm last summer. It gives me pause because I have taken refuge in an outhouse during thunderstorms myself. Hope no one was in there when the tree hit it. Click here to check out my Woods Island Video Diary.